The absolute most important part of any business is the customer. Without the customer, why even have a business? Yet many businesses and companies fail to ask the customer what their requirements are for them to be satisfied in said product or service. This one action is very basic, yet companies today would rather ask artificial intelligence than actually go to their own customers for their opinion, regardless of the method taken. Whether through customer ratings, surveys, market research or calls/interviews, getting the voice of the customer (VOC) is critical for feedback and improvement. Luckily, many large Fortune 500 companies have taken the leap and have proven that some things never change — the customer is always number one! 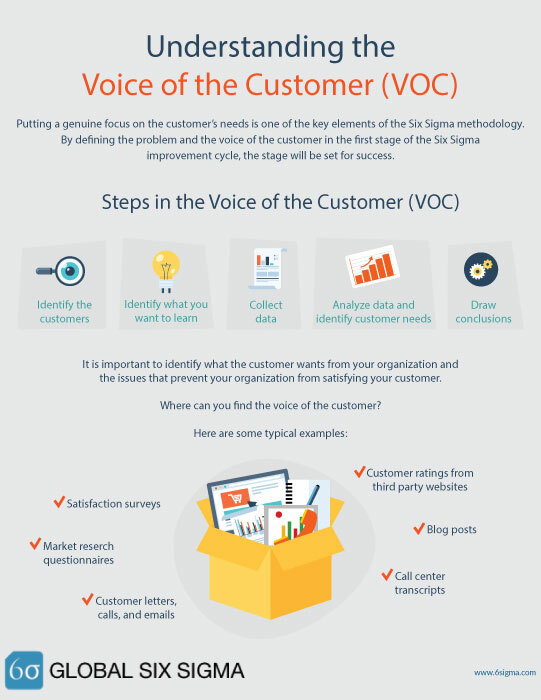 View our infographic below for some basic steps on VOC!